‘Otis could use your support. It is necessary for folks from the conservation organizations, environmental firms, university research and learning centers to provide not only academic support and new updated information about bats and their habitats but also generate research student enthusiasm and interest for the future. The private sector needs the latest information to make the right business and conservation decisions. State and county public works need to have a resource for supporting their work in a safe and environmentally sustainable way for people and wildlife. A state BWG is particularly important in WNS affected states where bats are so negatively affected. Interconnecting these disparate organizations and individuals via a central portal of knowledge and support for the benefit of bats and other similarly imperiled mammals is the primary mission of the group. This is intended to be a internal network within the state and external link to other states’ bat working groups. we are motivated to gather folks from our states institutes of higher learning, public service entities, private firms, and citizen scientists together to support bats and other threatened or endangered mammals in our state. Let us know if you are interested in joining the Bat Working Group in our special state of South Carolina. ‘Otis and other bats could use your support. 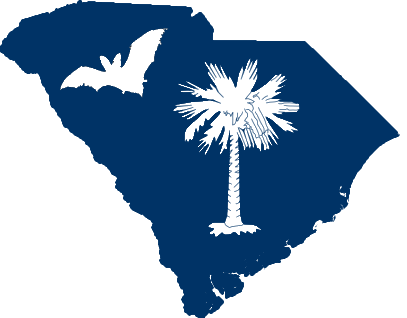 This Site is a resource for folks from all over South Carolina, the South East and elsewhere to connect and share Bat knowledge and Bat related activities in South Carolina.